This is a great waterfall. I've been here several times due to its location near interstate I-40. 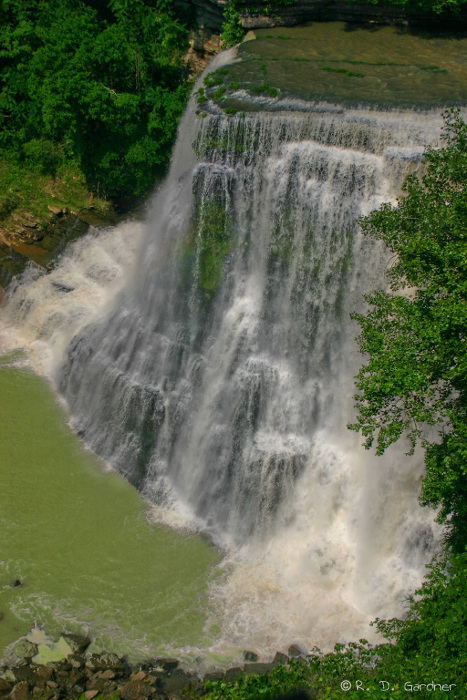 Being located in Burgess Falls State Park, this makes for a nice lunch break and leg stretching opportunity for the whole family. Along the way to the waterfall you will pass by three other waterfalls as well -Falling Water Cascades (20'), Little Falls (30'), and Middle Falls (80'). I give this waterfall an 8.0 with a WOW Factor of 7. It's very impressive with great volume, height, and width and the views are equally good. 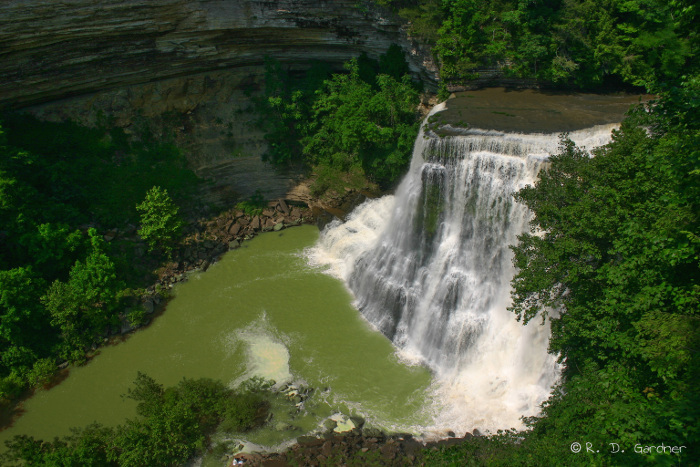 Burgess Falls State Park is located in middle Tennessee near the city of Cookeville. Directions can be obtained from the state park website or you can get personalized directions from Mapquest. 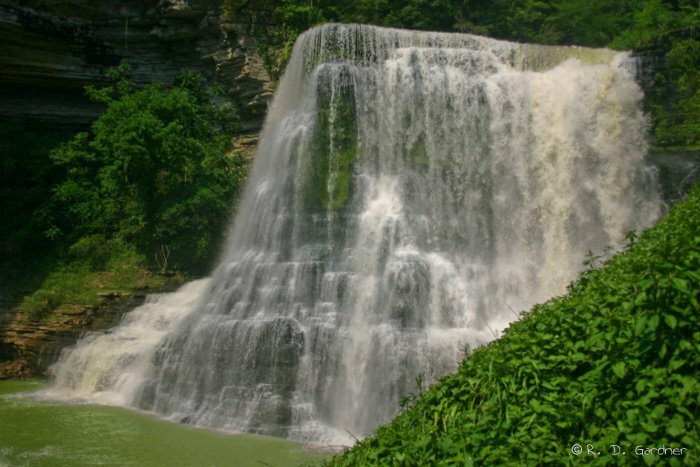 The hike follows the Falling Water River downstream toward Burgess Falls. There's a little up and down action on the trail but in general the trail is fairly easy. You are following the river downstream so the overall trend is downhill on the way out to the waterfall. It is 0.8 miles to the overlook. You can also continue down the trail to the top of the falls and then a combination of metal stairs and trail will lead you to the base of the falls. I had high contrast conditions when I was there since it was midday and sunny, not exactly ideal photography conditions. Anyway, the middle two photos on the left were taken from the overlook. 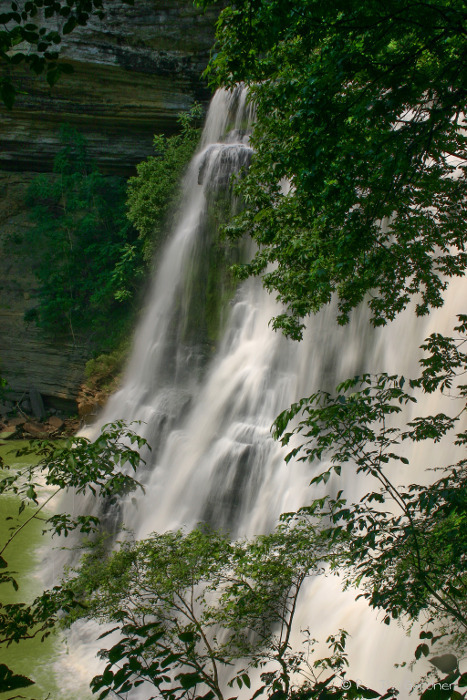 The main photo above was taken a little over halfway down to the base of Burgess Falls. While the view and composition are better toward the base, windy conditions made for a constant mist and very difficult conditions when I was there. I suspect this is a normal situation so be aware of the issue. On the bright side, a fast shutter speed works good for this waterfall so you don't have to take a lot of time setting up and composing the shot. Keep your back to the waterfall, get your camera ready, turn, and SHOOT! There are many good side shots of the falls as you go down to the base. One of my favorites is bottom left. Play with different compositions of trees and falls, zoom in and out and just have fun. As with any of the waterfalls in Burgess Falls State Park the river is very broad and open so sun is a constant problem except very early or late. Overcast conditions would be a blessing. You will want to use a polarizer to cut down on reflections. As far as a tripod goes, you really don't need one for this waterfall. Still, though, I would bring one. The side shots benefit from a longer shutter speed and you may find that you like the main falls better with the silky look. Hey, it's a free country.